Freelancers in New York City, or those who work for an NYC publisher, have a valuable new business resource: the Freelance Isn’t Free Law, which went into effect last May. The National Writers Union’s Grievance and Contract Division, under the direction of NYC member and national contract advisor Susan E. Davis, will work with NWU members to enforce this law. The legislation, which was initiated by the Freelancers Union and supported by the National Writers Union, has real teeth. Print or online publishers are to give freelancers a written contract, timely and full payment, and protection from retaliation—including immigrant workers. The law is poised to penalize violators by assessing them statutory damages, doubled damages, injunctive relief, and attorney’s fees. Complaints should be made to the Office of Labor Policy & Standards (OLPS), which is within the Department of Consumer Affairs. A state court will bring the cases with help from the OLPS. 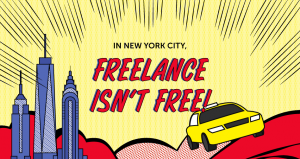 Where there’s evidence that a publisher has a pattern or a practice of violating freelancers, the NYC Corporation Counsel may bring civil action to recover a civil penalty of not more than $25,000.